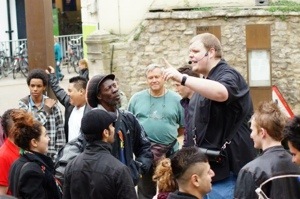 A Christian street preacher was arrested in Perth yesterday (18 SEP) for “breach of the peace” whilst addressing a crowd on the town’s high street. The arrest is the third instance since July of a Christian street preacher being arrested in the UK. Rev Josh Williamson, the pastor of Craigie Reformed Baptist Church in Perth, regularly takes to the streets to hand out leaflets, talk to passers-by and do open-air preaching. When Rev Williamson asked the officer to explain, he pointed to Williamson’s MP3 recorder and said that he was too loud. Rev Williamson explained that he wasn’t using any amplification and asked what would be an acceptable volume. The police officer replied that the noise level wasn’t the issue but that a complaint had been made. The officer insisted that he was not allowed to preach and told Rev Williamson that he would be arrested if he continued. When Rev Williamson said that he would not comply because he was not breaking the law, the officer placed him under arrest for breach of the peace. Rev Williamson was taken to Perth police station, interviewed and released with a caution. A second man, who spoke up in defence of Rev Williamson’s right to preach, was also arrested at the scene. “This is the third arrest in as many months. These street preachers are not breaking any laws and are perfectly within their rights. The police are overreaching their authority and misapplying the law. Their actions show an increasing hostility towards Christianity. “Freedom of speech is a precious freedom that we must uphold. This injustice must be tackled to halt the chilling effect already felt by many Christians. The threat to freedom of speech is a concern for wider society, not just for Christians. Other Christian preachers who have been arrested since July are Tony Miano (in London) and Robbie Hughes (in Basildon).